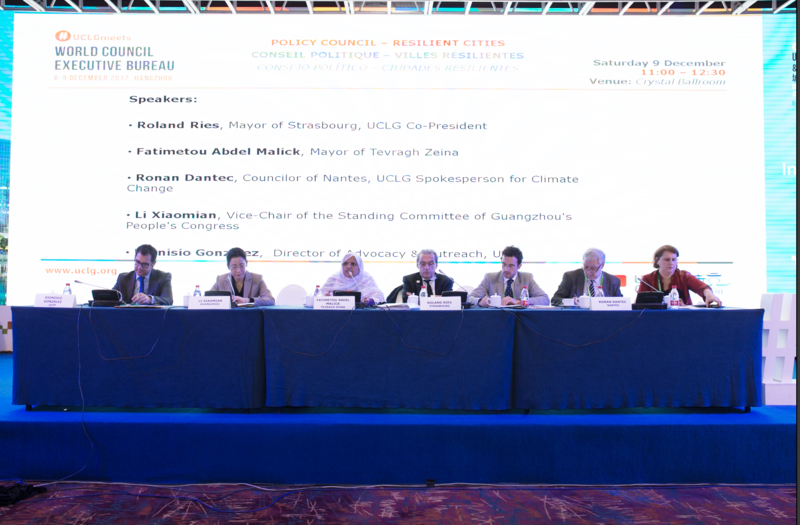 The UCLG World Council was held from 6 to 9 December in Hangzhou, China, at the invitation of Mayor of Hangzhou, XU Liyi. 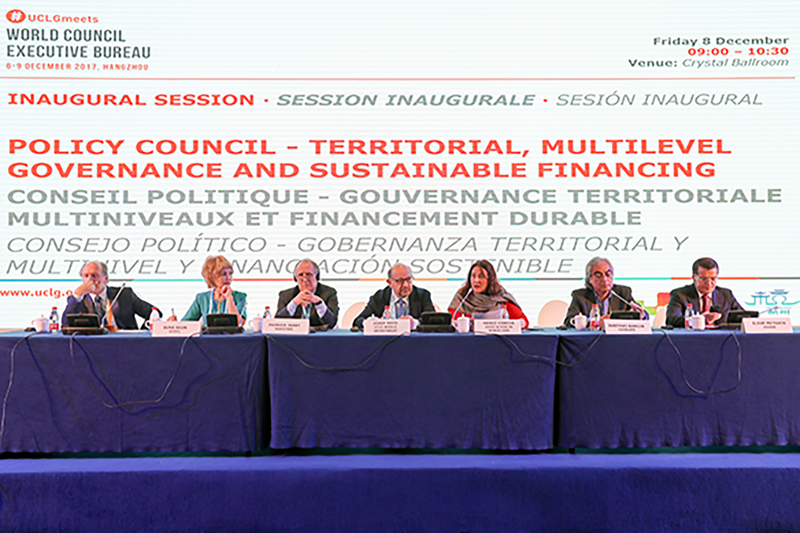 The UCLG World Council saw the inaugural sessions of the four newly created UCLG Policy Councils on Multilevel Governance, Resilience, the Right to the City, and Opportunities for All, which aim to increase political commitment on the major challenges faced by local governments around the world. The Policy Councillors on the Right to the City was chaired by the City of Barcelona represented by Laura Perez, Councillor of Barcelona. Councillor Perez welcomed the initiative of launching new Policy Councils, and underlined that the Right to the City should be at the centre of the governance of the city, including the right to adequate housing. It was agreed that Mayor Ada Colau and the President of Plaine-Commune, Patrick Braouezec, would lead the work of the Policy Council and that the Mayor of Lisbon, Fernando Medina, and the President of FCM, Jenny Gerbasi, would join the work of the Council. The Mayor of Lisbon emphasized that cities are spaces of diversity and that taking into account inclusion and equal opportunities is crucial for development. The President of the Federation of Canadian Municipalities shed light on the efforts made at local and national levels for social and affordable housing to create liveable communities. Participants referred to the need to acknowledge migration as a benefit and opportunity for our cities, and the need to support local governments hosting a high number of refugees, especially in the Middle East. 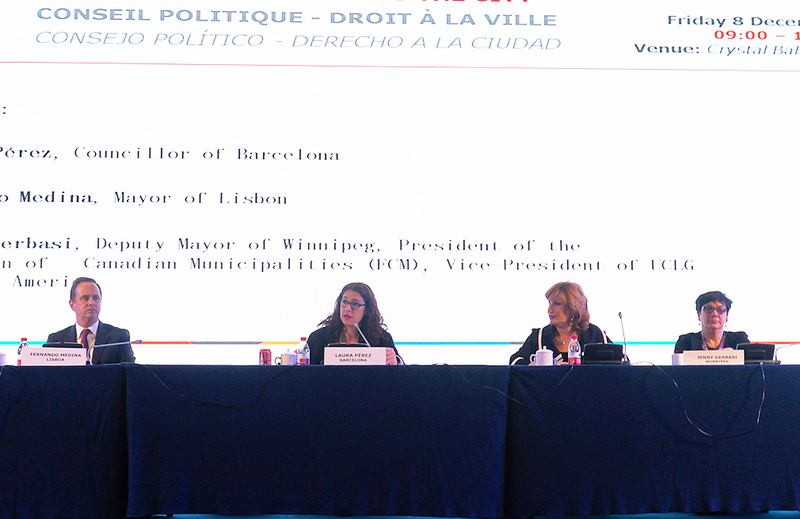 The UCLG Policy Council on Multi-level Governance recalled that decentralization, the principle of subsidiarity, and local autonomy are the core principles for renewed governance, as stated by the Chair of the Council, the President of the Province of Barcelona, Mercè Conesa. The President of UCLG Eurasia and Mayor of Kazan, Ilsur Metshin, referred to the need for a pragmatic approach and fruitful cooperation between local governments in order to better channel the sharing of best practices on multi-level governance. The Mayor of Kyzyl, Dina Oyun, and the Mayor of Nanterre, Patrick Jarry, shared their visions on a renewed system of governance from an isolated city (Kyzyl) and a peripheral town (Nanterre) in order to ground decision-making in the people, to reduce inequalities and foster sustainable development. Gustavo Baroja, Prefect of Pichincha and President of CONGOPE, recalled that decentralization without resources will not deliver results, and shared how new territorial alliances in his province helped achieve better governance. The Policy Council further agreed to continue their work under the leadership of Mercè Conesa and Monica Fein, Mayor of Rosario and UCLG Vice-President for Latin America. 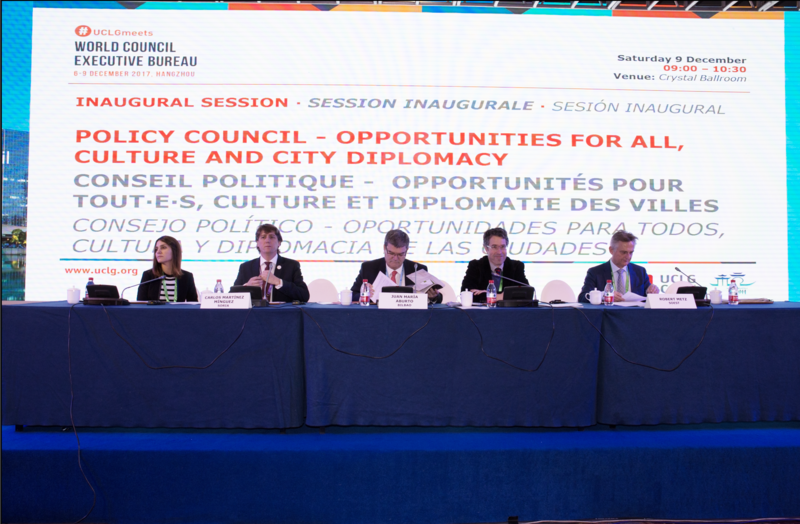 The third Policy Council on Opportunities for All reaffirmed that education, culture and city diplomacy are at the core of building peaceful cities. Under the leadership of the Mayor of Bilbao, Juan Mari Aburto, the Policy Council shared a set of public policies based on human rights, gender equality, transparency and social inclusion that have transformed the city and increased the well-being of its inhabitants. The Mayor of Soria and UCLG Vice President for Europe Carlos Martínez Mínguez put forward innovative policies on how his city appointed a team of citizens to take a number of the city’s decisions, enabling a radical change to be implemented in society. Finally, the Mayor of Soest, Rob Metz, stressed that city diplomacy is a crucial contribution for the well-being of citizens, especially in strengthening service delivery. The topic of Resilient Cities was discussed during the last UCLG Policy Council, co-chaired by the Mayor of Strasbourg and UCLG Co-President, Roland Ries, and Fatimetou Abdel Malick, Mayor of Tevragh Zeina. Roland Ries made three recommendations to be taken on board by the World Council regarding a renewed declaration on humankind, desertification and land degradation, as well as support to the One Planet Summit. Fatimetou Abdel Malick, UCLG Champion on Disaster Risk Reduction, recalled that further to the Sendai Framework on Disaster in 2015, it is pivotal to continue strengthening the capacities of local governments in terms of planning, prevention and the creation of emergency tools, as well as creating an enabling financial environment. The UCLG Spokesperson on Climate and Councillor of Nantes, Ronan Dantec, underlined the work of the international networks on climate, especially on financial mobilization and the linkages between the SDGs and climate agenda. Li Xiaomian, Vice-Chair of the Guangzhou People’s Congress, welcomed the initiative of the creation of such a Policy Council and explained to local leaders around the globe that the creation of a Community of Practice on Urban Innovation is aimed at pooling resources and enhancing project collaboration among cities. Chairs of the Policy Councils encouraged members to join in their work.